LA’s most unassuming and underestimated amateur sleuth investigates a sportswriter’s death. Elderly gardener Mas Arai is at Dodger Stadium, where his son-in-law, Lloyd, has recently been appointed head groundskeeper. Mas is waiting for the start of the 2009 World Baseball Classic, which will pit teams from South Korea and Japan against each other. Only a few moments after a commotion breaks out among a tightly packed group of Japanese reporters, Itai, a man in a white suit who’s the loudest and flashiest of the crowd, dies mysteriously. 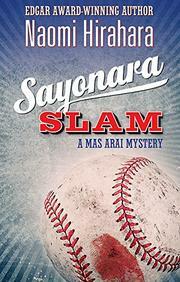 Mas, who gave the dead man his last drink, misses the game because he’s being questioned by police and fingerprinted. Though much about the day keeps nagging at him, he’s content to let it lie until he receives a strange offer from Yuki, a young Japanese woman who worked for Itai in their homeland. She hires Mas as a translator and driver—a cover story she sticks to in the ensuing days—but her real purpose is investigating Itai’s death. Incriminating information Itai had on a whole raft of Japanese players makes them de facto suspects. The investigation unfolds at a busy personal time for Mas, who’s contemplating cohabitation with his girlfriend, Gennessee, and worrying about his daughter, Mari, and his grandson, Takeo, in light of Lloyd’s less-than-dependable history. The case itself triggers complex memories of Mas’ World War II years. A major break in the case comes from an unlikely source: some graffiti on a bathroom wall. Written with heart, depth, and pace, Hirahara’s sixth case (Strawberry Yellow, 2013, etc.) is hard to put down.